Online banking and shopping is so yesterday. Thanks to new smartphone and tablet technology, you can deposit checks, make purchases, and even take credit card payments wherever you go. 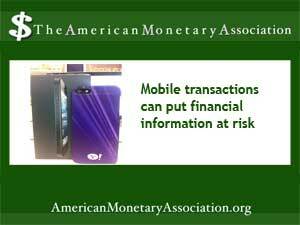 But the ease and convenience of mobile transactions also leave users vulnerable to identity theft and account hacking. Internet security experts recommend three steps to keep finances safe on mobile devices. Mobile devices rely on apps, short for applications, that allow for connections to online locations. Although apps for online buying, banking and many other functions are available from a variety of sources, fraud experts recommend getting your mobile apps from recognized and trusted App Stores, such as Apple, Amazon or Google. Untrustworthy third party apps may not be secure, allowing for hacking or intercepting the data you’re sending. You use passwords on your computer, so if you use your phone or tablet for financial transactions, it’s wise to set up password security on those devices too. It’s possible to set up several levels of password protection – for the device itself so no one but its owner has access, and for specific apps and files installed on the device. Although it may seem like a nuisance, establishing unique hard to hack passwords is a simple and cost free way to stay safe. While it’s easy to do a quick transaction over public WiFi in your favorite coffee house, experts warn that this is the easiest way for hackers to hijack your passwords and transaction information, including credit card numbers. When accessing websites from a mobile device, be sure that any site you send data to has a secure HTTPS connection, rather than the unsecured HTTP connection. That little S added to a site’s address ensures that data you send is only shared with the receiving device, while unsecured data can be picked up by other sources.